How can journalists fight the war on journalism, both in the U.S. and abroad? As governments hunt down whistleblowers, leakers and journalists alike, many reporters are worried they now work in a world that criminalizes their profession, calling this a “DEFCON 2 journalism event.” Most recently, Chelsea (formerly known as Bradley) Manning, the source of the Wikileaks disclosures three years ago was sentenced to 35 years in prison, and David Miranda was detained in Heathrow airport for nine hours while helping his partner, the Guardian’s Glenn Greenwald, obtain documents related to NSA spying. How worried should journalists be when reporting on political, international affairs or national security? How should journalists work in the surveillance state and continue to report? This week’s Mediatwits will feature Tow Center director and former Guardian editor Emily Bell, NYU J-school professor and PressThink blogger Jay Rosen and Free Press’ Josh Stearns. MediaShift’s Mark Glaser hosts, along with Ana Marie Cox from The Guardian, Mónica Guzmán from the Seattle Times and GeekWire and Andrew Lih from American University. Get the full rundown and guest bios here. How will we teach the next generation of the journalists? Such is the question raised in PBS MediaShift’s “Back to J-School” special, and we want you to help us find out. Will J-schools flip the curriculum, focusing more on digital skills than journalism basics? Will they flip the classroom, moving most learning online and turning class time into lab time? Or will they embrace MOOCs and other forms of online class offerings as a component of the future of journalism education? Check out the current list, and add to it! This is my first official attempt at crowdsourcing, and I want you to be a part of it. This is reminding me more and more of 2003. President Barack Obama has said the American response to the Syrian regime’s apparent use of chemical weapons must involve the international community. Unfortunately for Obama, a U.N. mandate — or support from almost any international institutions, for that matter — is looking unlikely. Maybe it was the heat. Maybe it was the sun. Or the weight of my backpack. Or of my clothes. Or a combination of them all. 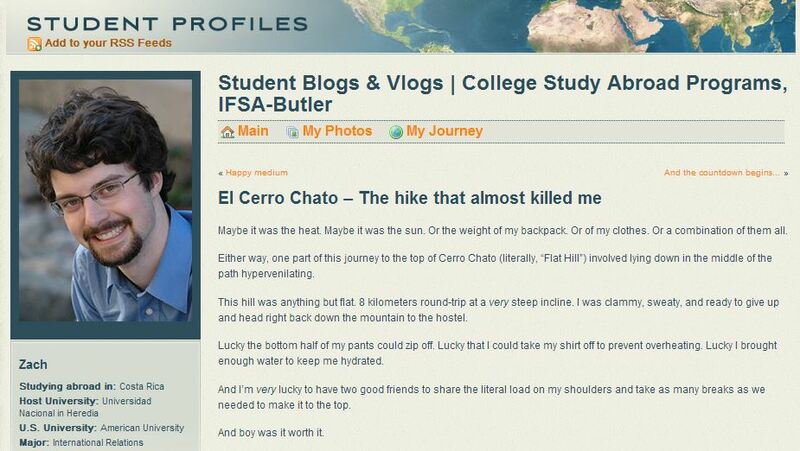 Either way, one part of this journey to the top of Cerro Chato (literally, “Flat Hill”) involved lying down in the middle of the path hypervenilating. This hill was anything but flat. 8 kilometers round-trip at a very steep incline. I was clammy, sweaty, and ready to give up and head right back down the mountain to the hostel. Lucky the bottom half of my pants could zip off. Lucky that I could take my shirt off to prevent overheating. Lucky I brought enough water to keep me hydrated. And I’m very lucky to have two good friends to share the literal load on my shoulders and take as many breaks as we needed to make it to the top. Check out photos of the magnificent view. Looking for a paid internship via telecommuting this fall at a respectable news organization writing and editing in-depth analysis of the journalism industry? Look no further than PBS MediaShift, which currently has two openings, one for an editorial intern and the other for a podcasting intern. I performed both duties this summer. It would give me no greater pleasure than to find a replacement that will serve the amazing team at MediaShift well. If you have questions about the internships, comment below. If we know each other and would like a recommendation, please contact me. Move now: Deadline is Aug. 30! Check out my latest photos of my trip to Costa Rica. This first batch is from a trip to Cartago for el Día de la Virgen de los Ángeles, the annual pilgrammage to the church of Costa Rica’s patron saint. The second is from a trip to a zoo near my home in Heredia, called INBioparque. Lots of beautiful butterflies, flowers, animals, insects, trees and more. It’s with a heavy heart that I announce that I’ll be leaving PBS MediaShift (and it’s podcast, Mediatwits) on Sept. 4. Long story short, I realized I needed to spend more time on my academic pursuits (especially when all of my homework is in Spanish) and exploring Costa Rica to its fullest extent. 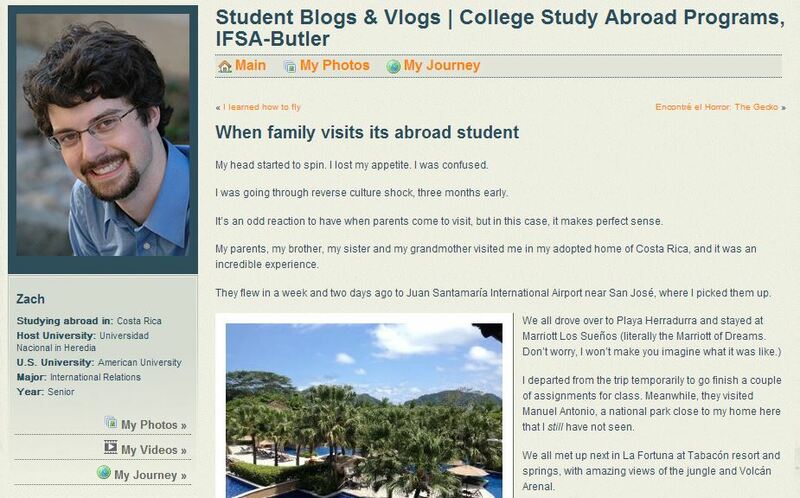 Read this post on IFSA-Butler’s Study Abroad blog on my reasoning to give up the best internship I’ve ever had. Thanks to Steff Dazio, Paige Jones, Rachel Karas and probably other people who told me to do this a long time ago and waited for me to make my own decision. I appreciate your patience and your concern for my well-being. Digital disruption has changed the landscape of the media world, and journalism and communication schools need to figure out how to educate in a time of vast change. The schools themselves need to change too, or risk falling behind. 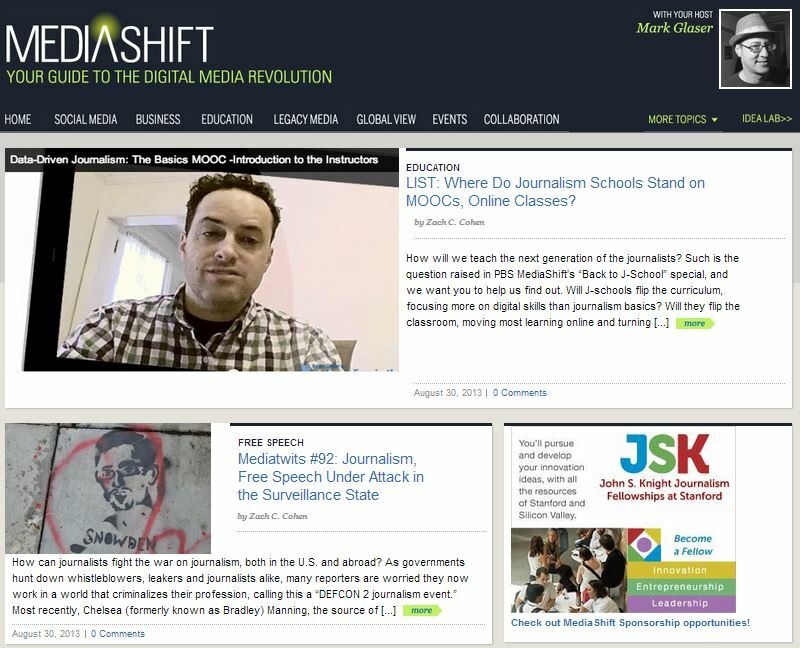 As part of this week’s special “Back to J-School 2013,” in-depth report at MediaShift, this episode of the Mediatwits will talk to students and professors alike on the value of a journalism education, the future of education innovation and more. Special guests this week are Howard Finberg, creator of NewsU at the Poynter Institute;Eva Avenue, former editor-in-chief of the Daily Lobo at the University of New Mexico; and San Diego State University professor and Knight Center MOOC coordinator Amy Schmitz Weiss. MediaShift’s Mark Glaser hosts, along with Andrew Lih from American University. Check out a rundown of all the latest research on this topic, as well as guest bios. Photo by Eagle Editor-in-Chief Paige Jones. Sometimes, for all the literal blood, sweat and tears, I wondered if it was worth it. Award or no, my experience working at The Eagle, including more than a year as editor-in-chief, has been the defining moment of my education, even though I wasn’t even a J-school major. I could not be more proud of our team of reporters, editors, photographers, designers, business staff, you name it. It belongs to each and every one of them. My head started to spin. I lost my appetite. I was confused. I was going through reverse culture shock, three months early. It’s an odd reaction to have when parents come to visit, but in this case, it makes perfect sense. Read the rest of the posts and check out some awesome pictures of hanging bridges, jungle vines, and, of course, Volcàn Arenal.